,At McLeod, we're people focused. It comes from our determination to do the best for our staff, our customers, our operational regions. We have a great association with Bay Venues to help provide swimming lessons to 1000 children under the age of three. We have a rewarding association with Tauranga Boy's College - Titans Sports - adding a lift to competitive youth achievement. We're an active project partner with Tauranga City Council. It's a way of joining with our local community and getting in behind the Council to make essential projects happen. 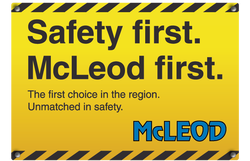 McLeod is an active partner to Surf Life Saving Easter Region providing heavy lift services and transport. We're delighted to be a supporting partner of the Lake Taupo Cycle Challenge. We share the same values, of goal-setting, and determination to succeed, whatever the distance.